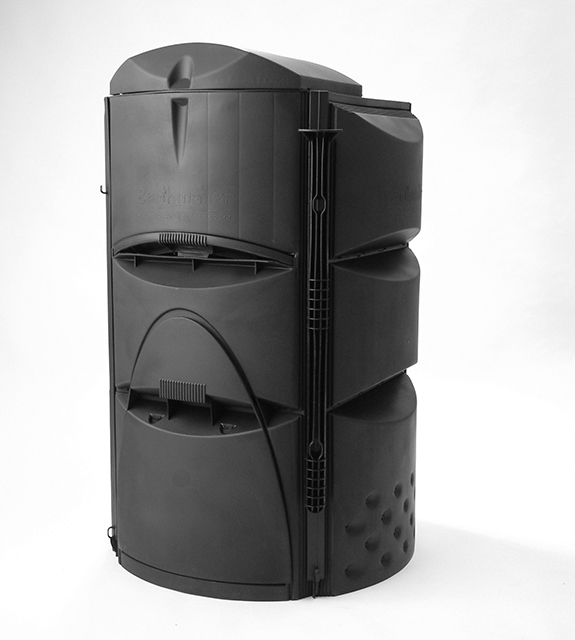 The Earthmaker is a revolutionary extra eco-friendly three chamber composter that takes the hard work out of the composting process! This efficient and easy to use system aerates naturally as heat draws air up through the bio-materials which spill deeper into the unit as they loosen. This works as a continuous cycle allowing you to add and remove compost when needed. The Earthmaker is always working and in most cases makes twice the amount of usable material as more convertional composers in the same amount of time. Makes usable compost in an average of 30 days when weather is ideal. Large 466 liter/ 123 gallon capacity. Can produce 35 liters/ 10 gallons of compost every month. Measures 1200mm / 47" high and 750 MM/ 30: diameter. Delivered in a flat pack that clicks together easily without tools. No composting experience required to get started. 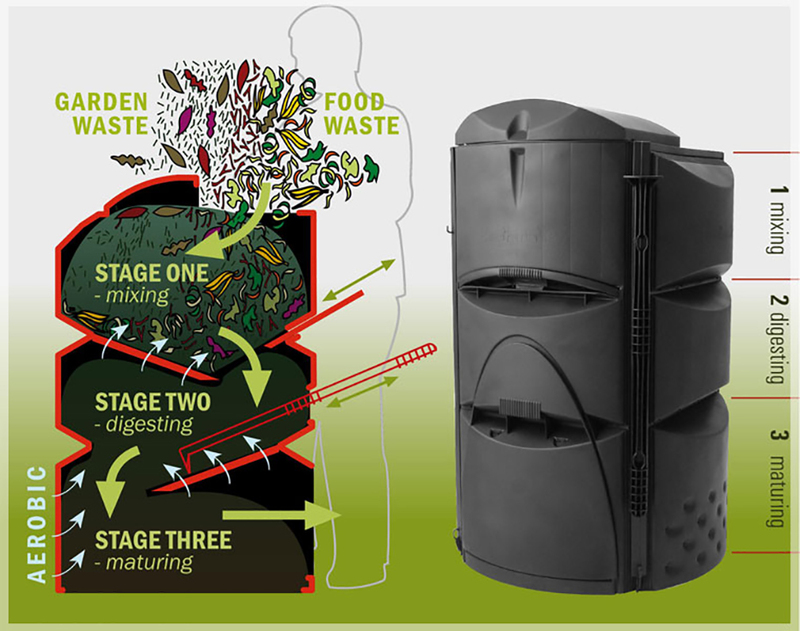 The world's first continuous cycle compost bin. Organic waste is added at the top anytime, quality compost is taken form the bottom when needed! And gravity does all the hard work!! Independent trials have proven the Earthmaker processes kitchen and garden waste at twice the speed of traditional compost bins. Material aerates as it falls down the chambers decomposing rather than rotting, thus reducing the production of greenhouse gases. Heat draws air up through the material reducing smells, flies and greenhouse gases. Very little effort and just a few minutes each month is required to move the contents form chamber to chamber. I live in New York City and I purchased a Earth Maker from Uncle Jim’s Worm Farm. My question is on the front panel and in the directions it states in hot climates do not leave front facing lid in the sun especially during midday. Now is New York City considered a hot climate and I should put it in a shady spot or is it ok to leave it in the sun so the extra heat generated will help with the composting process? Thank you for reaching out. I know New York City can get some brutal summer temperatures. Your site doesn't need to be fully shaded - but if possible, shade during the hottest point in the day, when the sun is the strongest (about 11-3pm) will be best. This is out of concern for the integrity of the plastic material and will prolong the life of the Earthmaker. Early morning and late day sun are not as much of an issue.